Canberra Hospital will soon use the Yacker Tracker to monitor noise levels in parts of the hospital to help patients get a good night’s sleep. Patients lose two hours of sleep at Canberra Hospital each night as a result of higher than recommended sound, with noisy nurses mostly to blame, an internal review has found. The nation’s first hospital-wide review of patients’ sleeping habits found only one-quarter reported a good quality snooze, which the report author warned meant slower recovery times and longer stays. Researcher Lori Delaney said the six-month study, set to bring about a range of changed practices, found overnight patients slept for an average of 5.3 hours at the capital’s largest hospital, 1.8 hours less than at home. “When you bring sleep down to that short quantity of time, there’s a lot of problems that come with that – including confusion, delirium and a lot of other physiological problems – that effectively delay their recovery, it means they end up in hospital for longer,” Ms Delaney said. The research studied conditions across 15 clinical areas of the hospital, with more than 140 patients and 81 nurses questioned about patients’ sleep. Research assistants also monitored sleeping environments for temperature changes and light, but it was noise which was found to play the largest part in increased waking hours. ACT Chief Nurse Veronica Croome said well-intentioned staff were most at fault. “By far the biggest contributor to noise levels are the nursing staff, who tend to congregate around nursing stations to discuss care and discuss planning around the shift,” Ms Croome said. Noise levels in clinical environments were found to be 11 to 25 decibels higher than the 30 decibels recommended for nocturnal noise by the World Health Organisation, the study said. The study found 41 per cent of patients reported a poor quality sleep, while 24 per cent described their sleep as good quality, although Ms Croome said most arrivals had expected disrupted rest. 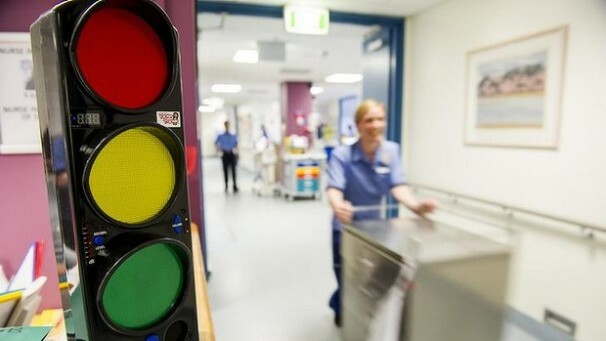 The report’s recommendations have led to a draft plan which proposes to have Yacker Trackers – traffic lights-style readers of noise levels – installed in busy clinical spots, as well as education for nurses to ensure patients’ care is tailored to prevent unnecessary disturbances. The plan also encouraged medical equipment that could have its sound lowered, and dimmer switches for lights. Ms Croome said the research was ground-breaking. “This study has the possibility of influencing the way in which hospitals are designed, the way in which wards are configured, and the way in which staff behave,” she said. The recommendations are expected to be rolled out across the hospital in the next two to three years, although simple moves – including nurses lowering their voices and giving ear plugs to those stuck near a snorer – could happen much more quickly. Posted on: 9 August 2014 . Category: Action by Responsible Authorities, General News, Research Developments. Tags: Canberra Hospital, Night time Noise, Sleep Deprivation, Sleep Disturbance.